Another Christmas is here. It’s been different in a number of respects, but one thing that I have discovered is that all that I love about Christmas is still with me and it’s something that is not taken away by mass commercialism, loss of a loved one or any outward cause. The wondrous and sacred gift of Christmas still comes in the quiet and the stillness. This year Christmas was different, but it was the same. My mother and I were determined to keep some of the same traditions alive that have always meant a lot to us and this year in some ways they seemed even more meaningful. One of the things that was different this year was the gift exchange. For about 12 or more years, my parents and I have not exchanged Christmas gifts. But this year my eldest sister organized everyone in the family into a secret present thing. We each drew a name and bought a present for that one person. Theoretically, nobody else would know until the zero hour. It would have worked that way had everyone not confided in her about what to get. So the morning came, and we exchanged presents. It was nice to be with family. The true high point of Christmas for me was the night before. All of my family who were in town (everyone except two nieces) came to the Lutheran Church where I’m the organist and choir director. The last few weeks before Christmas are always busy and hectic when one makes their living in church music. The culmination was the Christmas Eve service. The hymns of Christmas are always and forever will be a cherished part of the whole experience. Seeing my whole family there in church on Christmas Eve was another blessing. I was particularly touched by a story told by the pastor who was giving the sermon that evening. He spoke of a young orphan who had been visited by Christian missionaries in an orphanage in Eastern Europe somewhere. After the missionaries had told the children the story of Christmas, they provided paper, pencils, crayons etc. so the children could draw a nativity scene of their own. They all did. One little boy added something to his nativity that surprised everyone. He put two babies in the manger. When asked why he did this, he recounted the Christmas story and also added his own story. He said that being a poor orphan he didn’t have any gift to give him but asked if he could be with Jesus in the manger and keep him warm. Jesus told him that that would be the greatest gift anyone could give him. So the orphan was in the manger with Jesus, and Jesus told the orphan that he would be with him always. The point of the sermon being that whatever gift we bring to Christ we give him our heart and his promise is that he will be with us. After some sandwiches at my sister’s house, My mother and I made our way over to an Episcopal church for a late-night Christmas Eve service. Somehow in our family it just doesn’t seem quite like Christmas without a late night church service that features candles, and a LOT of music. The priest there spoke in his sermon about finding the extraordinary in the simple and ordinary. His example of this was that the birth of Christ was both extraordinary, as well as very ordinary. Simple and ordinary in the fact that babies are born every day. But even in the ordinary and every day occurrence of the birth a child is extraordinary. 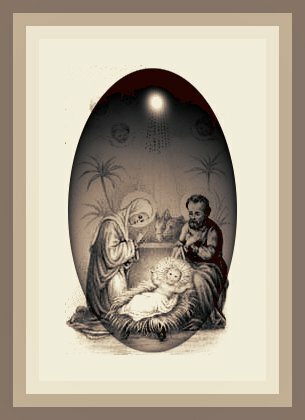 The birth of Christ was extraordinary and yet it was simple. Extraordinary in that Our Lord was born into mortality in a humble place. I preached a 2 minute sermon to my children on Monday. In it I asked them who wanted to go to heaven and be with God again. Then I told them that if Jesus had never been born, we could not have gone to be with God. I think the real meaning of Christmas finally sunk in. My eleven year old was especially surprised by that.